Sturridge remains part of Klopp’s plans at Liverpool, according to the manager. LIVERPOOL MANAGER JURGEN Klopp insists “all will be good” with Daniel Sturridge despite the forward’s benching at Tottenham. The England international looked displeased on the bench and came on in the dying stages of the 1-1 draw at White Hart Lane on Saturday. Sturridge had started, albeit out wide, in his side’s loss at Burnley, but dropped to the bench as Sadio Mane returned. Klopp has no doubt the 26-year-old has a role to play in his team, pointing to a need for a pressing game against Tottenham. “Daniel Sturridge is a wonderfully skilful player. But for the game, I made the decision that the kind of defending what it was and for what we needed,” he said. “In the last game against Tottenham at home he made an outstanding game so it’s possible. “But I can only pick 11 players for the start, I make these decisions never against one player so I’m really happy that we have him and he will play, he will score and all will be good. 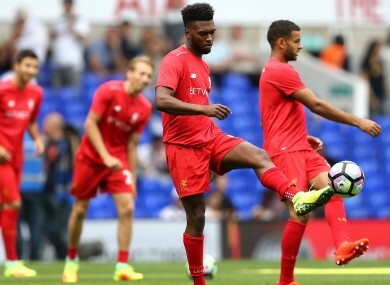 Sturridge suffered yet another injury in pre-season, hurting his hip in early August. Klopp said it was another reason for the forward’s absence, with Sturridge having played just 67 of a possible 270 Premier League minutes to start the season. “He did not have a perfect pre-season, that’s how it is,” he said. “A few other players had more pre-season. They played together. They’ve trained from the first day of pre-season together so of course that’s an advantage. “Then when you see when it was still 1-0, we needed someone to come on for the counter-attack, that’s Divock [Origi] and unfortunately even though he was running we didn’t find him. Email “Jurgen Klopp confident 'all will be good' with Daniel Sturridge”. Feedback on “Jurgen Klopp confident 'all will be good' with Daniel Sturridge”.